Are you sure you know Jesus? In the Roman Latin Rite at each Mass right before Communion we say: “Lord Jesus Christ look not on our sins but on the faith of your Church”. Yet what a mysterious expression this seems to be: “the faith of the Church”! We, as Faithful, believe what the Church believes. The one who baptises, baptises according to the faith of the Church. But what are the Contents of the Faith of the Church? Some might say: – it is the Creed. To a degree, the Creed does sum up all of our Faith. Others might even add: – it is the Faith transmitted by the Apostles, thereby reminding us that all the contents of “Revelation” were given to us, up until the moment the last Apostle (John) died. After that, there was nothing “new” to be added. All that is true. But I would like to enlarge on this a little, with the reader’s indulgence. The capacity to believeis not that obvious. If we focus a little on the Apostles themselves, we’ll find that they had their own journey of growth, and they themselves acknowledge to us, many times, in the Scriptures (the New Testament), that they couldn’t believe, that they failed. To clarify matters let us begin by briefly trying to sum up the essence of our Faith – the Faith of the Church – as concisely expressed in our Creed. Or, if you prefer, let us examine the main point in our Creed, for without it we can consider that our faith is meaningless. “if Christ be not risen, then is our preaching vain, and your faith is also vain” St. Paul clearly states in1 Corinthians 15:14. Here he underlines that the belief in the Death and Resurrection of Jesus is the core of our faith. To go from where we are to where God is, from darkness to God Himself, this involves a journey; it needs a bridge, and without that bridge, we cannot reach God. Just remember Adam’s fall. We are not now living in the joy of the Presence of God! Without that “bridge”, without Christ and what He realises on the Cross, we cannot reach the Father. We can sum up the preaching of Jesus, in its widest sense, in this Promise: “I will die and I will rise again”. To be exact, the Lord Himself does it, and He does it, three times. Thus if you look at Matthew, Chapter 16, you will see His first announcement of His Death and Resurrection, namely, “From that time on Jesus began to explain to his disciples that he must go to Jerusalem and suffer many things at the hands of the elders, the chief priests and the teachers of the law, and that he must be killed and on the third day be raised to life.”(Mt 16:21) This announcement is followed by two, almost identical ones: see Matthew 17:22-23; 20:17-19. 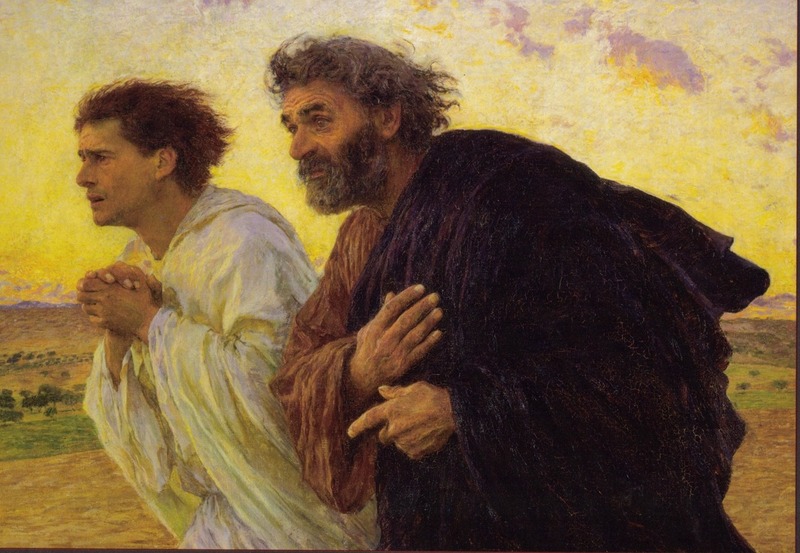 Yet despite these announcements, the striking thing is that in such a vital matter, the Apostles not only failed to believe in Jesus’ Word, His only Word that mattered in His entire Message, that is, “I will die, and I will rise again”, but they also, in their writings, they acknowledged their lack of belief: “we failed” is what comes across clearly in the accounts of their reactions to this in the Gospels. Significantly if the first part of Jesus’ announcement (“I will die”) was the biggest shock of their last three years following Jesus – they were shattered – the second part of His words (“I will rise again”) was impossible to grasp. He died, and He WAS really dead was all they could take in. It ended there. The concept of Resurrection itself was something really alien to their thinking. Here we would do well to cast our minds back to the day the big-three (Peter, James and John) were coming down the mountain after the Transfiguration, when Jesus mentioned His Resurrection, and they wondered “what it meant”. “As they were coming down the mountain, Jesus gave them orders not to tell anyone what they had seen until the Son of Man had risen from the dead. They kept the matter to themselves, discussing what “rising from the dead” meant”(Mark 9:9-10) The concept is entirely new to them. Unheard of before. Now I challenge you, at your leisure, to go through all the accounts of the Resurrection in the four Gospels, and try to find one Apostle, or one of the holy Women, who believed in Jesus’ Resurrection. Peter and John? They didn’t believe: “They still did not understand from Scripture that Jesus had to rise from the dead” (John 20:9). So, amongst the Apostles, who believed in the Resurrection? Put simply: nobody. It would be wise to pause here for a moment of serious reflection. If this is “our faith”, if this is “the faith of the Church”, the “faith of the Apostles”, then there is a serious problem. The Apostles themselves are telling us clearly that they did not believe. So, expressed in very clear terms it must be recognised that nobody was waiting for Him to Rise. In fact, this is a very fair and logical assumption to make. Likewise one can assume that the story of the five wise virgins (Mt. 25:1-13) is just as unbelievable: surely your master (any of the Apostles for they are the ones who wrote the Gospel, of course inspired by the Holy Spirit) cannot invite you to do something that he himself was not able to do? This is why, I do not easily accept the fact that “the faith of the Church” is exactly “the faith of the Apostles”. There is a missing link: is there anybody waiting for Jesus the Risen Lord, early on Sunday morning? To help you find the answer, let us briefly go back in time to the beginning of Luke’s Gospel. Is Anybody There Waiting for Jesus, the Risen Lord, Early on Sunday Morning? This is a crucial question that is hardly ever addressed, while significantly the Lord Himself, in the Gospel, urges us to address a very pertinent issue: in Matthew, Chapter 25:1-13 the Lord tells us a parable, the so-called parable of the ten virgins. The lesson of this parable is given at its end: “Therefore keep watch, because you do not know the day or the hour”. The outer framework of the parable is: “meeting the Bridegroom” when He returns. In order to “be there” when He comes back, one has to “keep watch”, to remain alert, to be ready as symbolised by the oil-filled lamps, in order to “enter with Him” into the wedding banquet. The Parable can be divided into a number of stages for consideration, as follows. 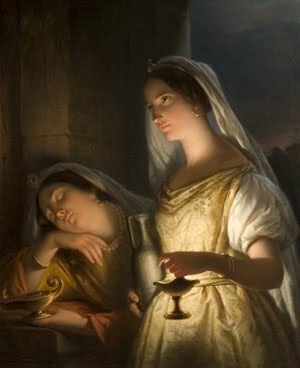 “At that time the kingdom of heaven will be like ten virgins who took their lamps and went out to meet the Bridegroom. Five of them were foolish and five were wise. The foolish ones took their lamps but did not take any oil with them. The wise ones, however, took oil in jars along with their lamps. The bridegroom was a long time in coming, and they all became drowsy and fell asleep. While my aim is not to comment upon or interpret this parable, and apart from its intended meaning to “keep watch”, this parable to me… . To me, on top of its proper intended meaning (“keep watch”), this parable sheds an intense light on the very moment of the Resurrection of the Lord. This will thus be seen as a “coming back”, “from afar” (from death, and hell), of being “victorious over death” and will reveal the necessity of waiting for Him, and being ready when He comes. I see the Resurrection as a “meeting moment”, and an “entering into the Kingdom”. Let us just appreciate the intense Light it sheds on the Resurrection. I would also urge you to re-read this Parable concentrating on the hours after Jesus’ Death, and noting if there is anybody “waiting” for Him, when He rises. I see the fact of meeting the Lord at His Resurrection as a vital fact for the future of Christianity. It is the vital and necessary bridge that reunites what happened before His Death, and what unfolded after His Resurrection. If this is not so, there is a gap, an abyss, a missing link between these two blocks. We take His Resurrection for granted. We think: “oh well, He had to rise anyway”. But in fact, it is not true. 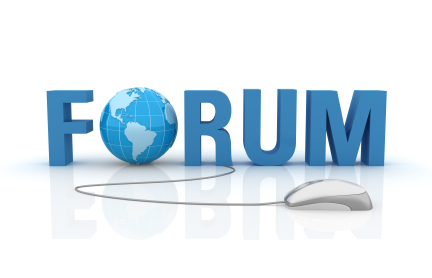 If there is no flow of communication between the realities of the Kingdom before the Resurrection and what can happen after His Resurrection, we are facing a disconnection, a very dangerous hiatus. Therefore, as crucial as the lesson told by this parable is, I consider to be even more so the presence of someone who waits for Him, desires his Resurrection wholeheartedly, wants it and prays for it; the presence of somebody to greet Him at His Resurrection and “enter with Him into the Wedding Banquet”. It is undeniable and but common sense here to say that, in order to “be part of” the eternal “Wedding Banquet”, the Kingdom of God, it is important to “be there”, in order to greet the Bridegroom. In order to answer this question, we will go back to the beginning of Saint Luke’s Gospel. The structure of the opening chapter of this Gospel is fundamental. 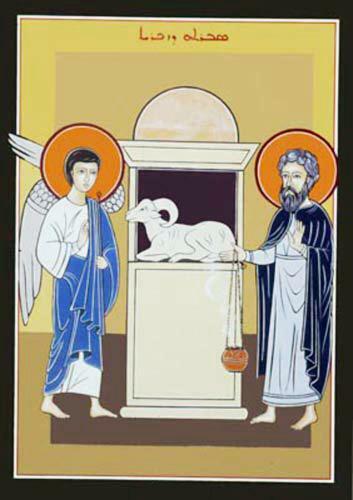 Saint Luke offers us two annunciations made by the same very High Messenger of God: the Archangel Gabriel. Second,it comes to Mary, a young girl, who is also praying, and awaiting the coming of the Messiah, to whom God announces the “good news”, by sending His Angel, carrying the Sacred Message. The fundamental question to ask, however, is: Who is ready to receive the Messiah? Both are praying, Zachariah together with the whole people of Israel, and Mary. Who is capable of believing? Who can open his heart and his whole being to the coming of God-amongst-us? Here Saint Luke is not giving us a straightforward account, or simply telling a story. He is giving us a crucial element that will influence our future: how can it be that we believe? 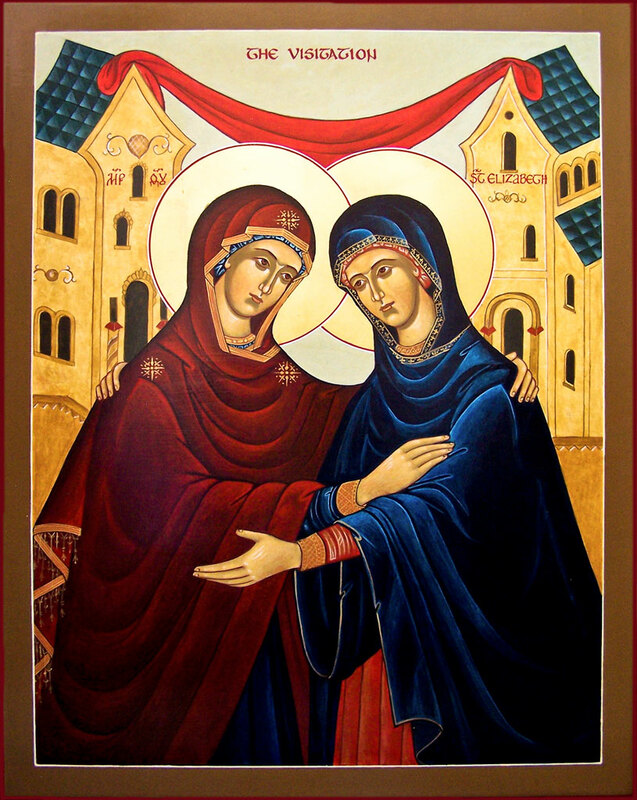 The two annunciations are told in parallel, in order to help us contemplate the difference between Zachariah and Mary. At the core of each we have the “capacity to believe”. Not only that, but Zachariah’s failed annunciation is redeemed by Mary’s double act: she believes “for herself”, and “for Zachariah” who didn’t believe. This is seen in the sense that she also had to believe that her cousin, Elisabeth, at a very old age, was pregnant as well by the action of God who had healed her of her infertility. This diptych, or twofold parallel story, is fundamental to help our understanding that Mary really is the first fruit of the Redemption. She is “full of grace” by a grace of God, a grace totally coming from “Her Saviour” as She herself states it in Luke 1:47, from His Salvation realised on the Cross. It is true that the Salvation on the Cross happens, in the stream of time, after Mary’s birth, but the Cross transcends time, covers all the ages. Foreseeing the Salvation of the Cross, God extracts Mary from Jesus’ side, as the “New Eve”. Dante rightly calls Mary: “daughter of your son”. In sum, without Mary’s faith, we would not have had Jesus, this is true. But without Mary’s faith, Elisabeth and Zachariah would not have been given the opportunity to believe in Jesus. Both Mary’s fruits are of the utmost importance. To put it in simple terms, it is not enough only to have “the Redeemer”, “the Divine Seed”, “the Heavenly Wine”, but we also need “the capacity to receive Him”. This is why Mary is called the “one who believed” (Luke 1:45), the “Good earth” (Mt 13), the “New Skin” for the new wine. In addition, She is called “Jacob’s ladder” (see John 1:51), because in Cana She is the one who is capable of believing in Jesus, and She is the one who leads us, in her faith, to Him. We should “climb” up that Divine Ladder, given by God to us, in order to believe in Jesus, and reach his Side, and say again with Thomas: “My Lord and My God” (John 20). Seenfrom a different angle then, in our Baptism, God gives us two things: the “object” of our Faith: Jesus, who is everything for us, our “All”; and the “subject” of our Faith: Mary’s capacity to “believe” and follow Jesus. Mary continues to believe throughout her life, and reaches the point, at 3 pm, on Good Friday, where again and again, She is alone, and having to believe in the Core of Jesus’ Message: “I will die and will rise, on the third day”. 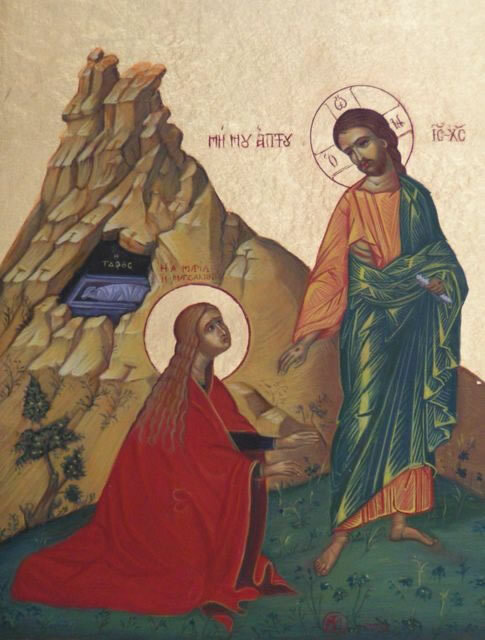 She is the one who carries the “Fire” of that Promise, protects it against the stormy attacks of death, hell, and so forth… and keeps it intact, waiting, praying, fighting, aspiring, desiring to meet the Risen Lord, when He comes back from the land of death. And what happens in the early hours of Easter Sunday? Now juxtapose this question onto the words: “On the Third Day, there was a Wedding” (John 2:1). Do you see what immediately comes to mind? Can you visualise the wedding? But….who is the Bridegroom, and who is the Bride? Now take a moment to reflect on these questions while re-reading John 2:1-11 below. Try to see it under the light of what has been unveiled above. “The capacity to believe” in the Resurrection, our core belief, was not within our grasp at all. Nobody (except Mary) was capable of believing the Word of God at the Annunciation, nobody was capable of believing the Word of the Son of God saying that He would die and rise again. Therefore, nobody (except Mary) was waiting for Him, was expecting Him, nobody believed. They all struggled to believe in His Resurrection, and even when they saw Him risen, many had doubts. But you might find all this to be “normal”. That “He had to rise anyway”. That “anyway He had to do it all by Himself”. Well, with all due respect, this is not totally true. Let us go back to a very simple (but striking) statement made by Saint John Paul II and, afterwards, introduced into the “Catechism of the Catholic Church” (CCC). “The “Marian” dimension of the Church precedes the “Petrine”” (CCC 773), namely, precedes the dimension of Peter. It alludes to the hierarchical dimension of the Church. But we should add: it also alludes to the Apostolic dimension of the Church. To re-iterate, all this body of intuition and understanding of the relationship between the Apostles, the Church and Mary, has been introduced in a more formal way in the “Catechism of the Catholic Church” as follows: ““the “Marian” dimension of the Church precedes the “Petrine”” (CCC 773). It might look straightforward and obvious? Maybe. To me, however, it should be simply mind blowing to everybody, especially as it has multiple consequences in our daily lives. In our name, Elisabeth said to Mary: “blessed is she who believed” (Luke 1:45). The message is clear one could venture to say. After all, one can think that if Mary “is an exemplary [the best] realisation of the Church” we still have other realisations: Abraham (as stated by the Catechism, see 148 and following), Peter, the rest of the Apostles, the Martyrs, all the Saints. While comparing Mary’s faith (and Her role in our life) with other saints (the Apostles for instance), the comparison is not at all a matter of degree. Mary’s faith, belongs to another order. She belongs to another league: she believed where nobody could believe. It is not that somebody was able to believe a little bit. No. It is certainly related to her Immaculate Conception, related to the fact that not only before the Cross, but also because of the Cross, She was born with no sin, came in fact from the side of Jesus on the Cross, the “New Eve”, as “the First Saved Person”, but came also as “the Mother of all the Saved”. She is made “mother” by Jesus, and with Jesus. We should hear Jesus’ voice speaking to each one of us saying: “here is your mother”, you can’t reach Me without her. She’ll form in you the new “capacity of believing”, She’ll keep you “in her womb”, “in her Heart”, She’ll form you, – you “my Body” – as she formed Me in her. It is of the utmost importance that we understand with every fibre of our being, that it is acutely, radically and vitally indispensable that we “take Mary into our home”. Our eternal life, its very quality, depends on this! We need to have the humility not to pretend to “follow Jesus” by our own means, but with the help of Mary’s faith. We need to acknowledge that “she believed for me”, and use this asset, this huge Talent, received in our Baptism in order to grow. We need to discover how acutely “helpless” we are when it comes to following Jesus to the end, till real-holiness, without the help of Mary. Her help and presence are not something optional in our lives. She is part of the structure itself of our Faith. Her faith becomes our faith (as Saint John Paul II wrote in his Encyclical letter: “Redemptoris Mater”, 20). Jesus, in our Baptism, gives us the “object of our faith” (Himself) and “the capacity to believe in Him”. All that we have to learn is how to “receive her into our home”, into our daily life, to receive the gift of Her presence, and use it for our spiritual growth. We need to receive Her from the Hands of Jesus, from the Cross, as our “spiritual Mother”. In order to “receive Mary” into our lives, we are invited to offer to place ourselves totally into Her Hands, be open to the full Action of the Holy Spirit, She being full of the Holy Spirit. This is what we want: the full action of the Holy Spirit, with no obstacles. After this, we need to let her act constantly, to show, guide and inspire us. In this way, “our inadequate way” of dealing with Jesus, is transformed into “Her way of dealing with Jesus”. We go from a very weak, slow, radically incapable way of dealing with Jesus, to a successful way – Mary’s way. In sum, if we want to reach our own resurrection (Union with Jesus), if we want to reach the fullness of growth of our faith, there is no other way than Mary’s. All else is a waste of time and leads to dead ends. Rather it would be better to keep meditating on how and to what degree Mary’s action in our life is not just an optional thing, and that it is simply impossible to do it in another way. Let us have the right humility to accept God’s means, not ours, in order to become saints, in Mary’s womb. In one of his letters, Saint Antony says that Christ’s Yoke is the Holy Spirit. It is not difficult to accept this reading if one looks at Scripture. Jewish tradition – and St Paul is part of it – does talk about the “yoke of the Law” which he refers to as the “yoke of the Torah” (see Galatians 5:1 and Acts 15:10). Our New Law, however,is the Holy Spirit in our heart (see Jeremiah 31:33, Romans 8,…). Thus, one can easily accept the reading St Antony gives us of this image of the “yoke” given by Christ. 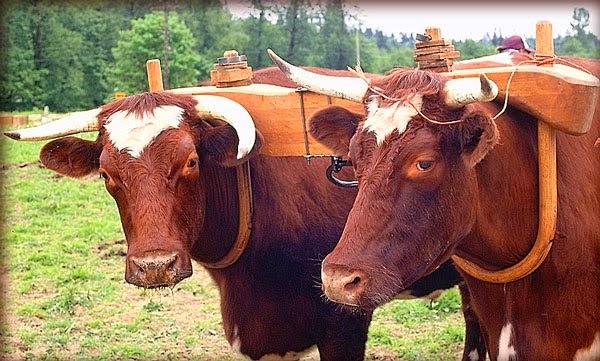 If we look at a yoke, we can see it is a piece of wood that binds two animals together. Normally one would spontaneously think that carrying Christ’s yoke means that the yoke would cross over the shoulders of Jesus and ourselves, so we would be walking together. However, we need to take into account the identity of the two people put under the same yoke. One of them is Christ, but who is the second? We can find answers to this question in the Song of Songs. Jewish tradition says that if the Bible were to be compared to the “Holy” of the Temple [the room before the Holy of Holies], the Book of the Song of Songs should be considered as the Holy of Holies. The Catholic interpretation of the Song of Songs, offers at least three different levels of readings: the Groom, who in the book is of course always seen as Christ, but the Bride can be either the Church, or the Soul, or the Blessed Virgin Mary. If we, then, put things in order: we should put the Mother of the Church (Mary) first, the one who gives birth to the Church, then the Church and its members. The Church is Virgin and Mother like Mary and because of Mary. The Church sees in Mary its Archetype, namely, its best and highest realisation. This is why we see in Mary the perfect Disciple of Jesus, as well as its embodiment. Therefore, theologically, we should see the Archetype of the Groom and the Bride in the Song of Songs, as being: Jesus and Mary. The Marian Spiritual Catholic Tradition underlines the unique relationship that exists between Christ and his Mother, Mary. As we have previously explained, in Baptism, God does not give us only the object of our belief, Jesus-God, He gives us, as well, the capacity and the means to Belief: Mary’s belief. He gives us not only the Divine Seed, He also gives us the “Good soil” in order to receive that Divine Seed and bear fruit. He does not give us only the New Wine, but the New Skin in order to contain it, otherwise, with our poor capacity for retention we would lose God’s graces. Mary’s capacity to believe is given to us. This teaching is the Holy of the Holies of Revelation, Scriptures and Theology. It sheds, in addition, an amazing light on the question of Christ’s Yoke. Christ’s Yoke doesn’t consist only of Christ (as one of the animals) and the Holy Spirit (as the piece of wood). No. It encompasses much more: it has Christ, the physical Yoke (the Holy Spirit) and Mary, as being the embodiment of the Perfect Disciple. In Her and with Her, one becomes the Perfect Disciple of Jesus. This would imply that taking on Jesus’ Yoke would mean to enter into Mary, to receive Mary’s capacity to know and love Jesus. This is why, if we go back to the diagram of the Sea, we realise that when we receive Jesus’ Yoke, in fact we are taking the place of Mary, or better said: we receive our New Being from Her, in Her image. She is “flesh of Jesus’ flesh”, the New Eve, the Woman, taken from the Man, Jesus. She is bone of his bones. She is capable of containing all of Christ, in His fullness, without losing any grace. Christ dwells in His Fullness in Her… therefore, if we want Him in His fullness, we need to take Mary to ourselves, receive her into our very being, in other words: Receive Jesus’ Yoke. This is why, the Prayer of the Heart which bears fruit is indeed the one that receives Jesus’ Yoke, which takes the place of Mary, in the sense of being transformed in Her, of being transformed by the Holy Spirit. Monsieur Olier, one of the greatest French Catholic mystics of the 17th Century did contemplate the deep and spiritual relationship that exists between Jesus and Mary. For Olier this is the mystery of mysteries – up to now so little known, loved and respected. For the first time in history, extracts from his letters – an incomparable treasure – have been translated into English; a message which should greatly influence and have great meaning for our own spiritual life and the world today. 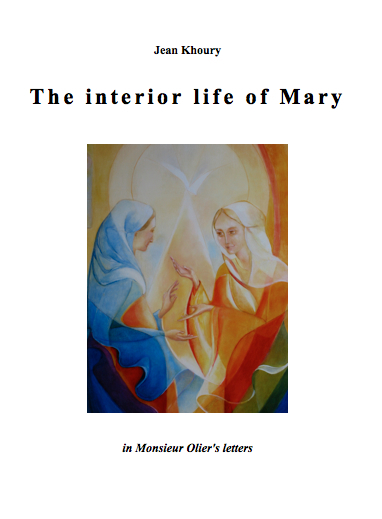 You are invited to discover what Olier calls: “The Interior of Mary”, invited to dive into it. What a ground-breaking exploration!